E.J. Lopez ’15 hit his first career homer against top-ranked Linfield at the NCAA Division III Baseball Championships in Austin, TX. Claremont, Calif. (May 27, 2013) – The end of the 2012-13 Sagehens athletic year, several Pitzer athletes earned All-SCIAC accolades while the Baseball Team went 11 innings in its opening round NCAA Tournament game against nationally-ranked Texas-Tyler before falling in a heartbreaker. Postseason awards were announced with Erik Munzer ’13 earning first-team All-SCIAC honors in Baseball, Maxwell Sabel ’13 and Christopher Wiechert ’14 earning first-team All-SCIAC honors in Men’s Tennis, Jamie Solomon ’13 named to the first team in Women’s Tennis, and Katya Schaefer ’16 earning Newcomer of the Year honors in Women’s Water Polo, while Alyssa Woodward ’15 was named to the first team. Women’s Lacrosse’s SCIAC honors were announced earlier this month with three Pitzer athletes earning first-team accolades: Casey Leek ’13, Rachel Kessler ’14 and Jana London ’14. The trio also were named All-West Region by the Intercollegiate Women’s Lacrosse Coaches Association. On May 15, Baseball traveled to the NCAA Division III Championships at Concordia University in Austin, Texas, for the first time since 2010, and came up on the short end of a 4-3 decision in 11 innings to Texas-Tyler. Samuel Fox ’15 doubled and scored the third run for the Sagehens and nearly drove in the go-ahead run in the eighth inning with the score tied 3-3, but was called out after apparently beating out a single with a runner on third. The Sagehens had one more chance in the double-elimination tournament, but had to face Linfield, the top-ranked team in the nation, needing a win to stay alive. 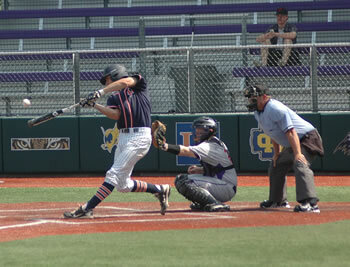 Linfield scored twice in the first inning, but E.J. Lopez ’15 hit a solo homer in the second, his first career home run, to get the Sagehens back in it. However, the Wildcats scored four times in the third to take a 6-1 lead and were able to pull away. Fox batted 2-for-4 to give him two hits in both games, and also scored two runs. Munzer added an RBI single in his final collegiate game. In Men’s Tennis, Sabel competed at the NCAA Division III Doubles Championships, along with his doubles partner Frankie Allinson PO ’13, but fell in the opening round to a team from Bates, ending their careers after a strong senior season which saw them pick up 20 doubles wins playing in the No. 1 position. Sabel suffered a wrist injury prior to the NCAA Championships, but played through it in his final collegiate competition.